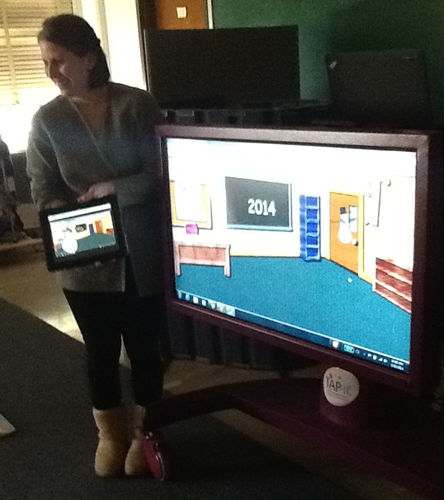 Staying up to date on the newest technological resources in education can be overwhelming! Blogs and Pinterest can be great sources of information to stay in the loop. I recently started using a new piece of equipment, the TAPit. TAPit (Touch Accessible Platform for Interactive Technology) is a device that works really well with special needs students, or any student for that matter. It looks like a big screen television on wheels. The amazing part is that the screen syncs to a computer, turning any computer into a larger version that the whole class can see. The reason it works so well with special needs students is because it is engaging and accessible. 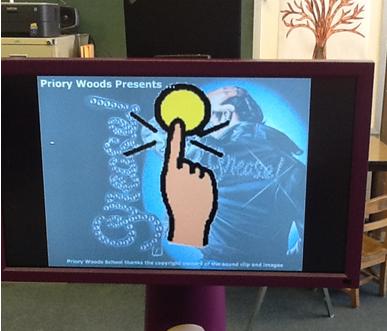 The screen is controlled by touch and is portable and adjustable. 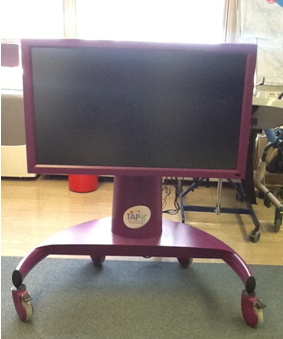 The TAPit is great for kids who are physically handicapped because it can move to them – it’s basically a portable smart board. Think of all the possibilities for fun lessons! 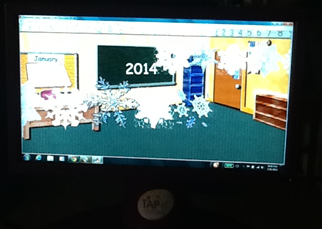 The TAPit is an awesome tool for teachers and therapists. It runs any program on your computer so there are tons of possibilities for lessons. I love using it for group sessions. Some of my favorite ways to use the TAPit are using Board Maker Speaking Dynamically Pro, Intelli Tools, and Priory Woods switch activities. You can also connect it to any website. It works as a nice break for students, who can select YouTube videos to watch or an online game to play. As you can see in the picture above, I wrote a story about Groundhog’s Day on Boardmaker. The students can take turns tapping on the words to hear them read and hitting the next page button to turn the page. One complaint about Speaking Dynamically Pro- the text to speech sounds awful! Luckily you have the option to record your own voice over it. 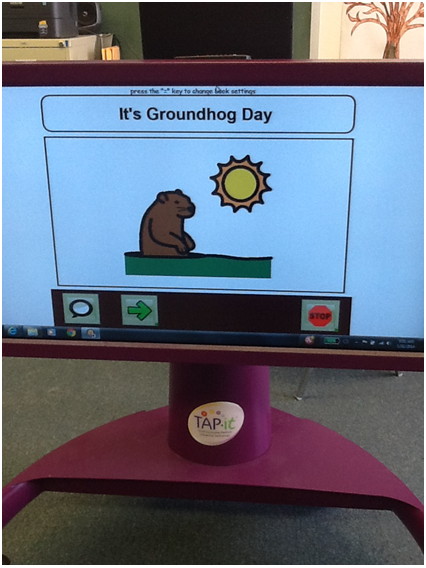 At the end, students answer comprehension questions and receptive ID such as, “When is Groundhog’s Day?” (February or July with Boardmaker visuals). The activities are interactive and engaging for my students who are cognitively and physically impaired. IntelliTool’s Unique Learning System provides interactive lessons which have features of moving pictures and a nice voice that reads. Unique Learning System isn’t free but does offer a free trial. The lesson in the picture above is all about the month of January with pages on winter clothing, winter books, and New Year’s. Students can use the touch screen on the TAPit to answer questions and follow the directions to touch and move certain objects. After they follow the directions, they are rewarded with fun noises and moving images. One of the best parts about the TAPit is it will sync to your iPad! This is super helpful for groups because I can walk around with the iPad for students and also ask them to walk up and touch the TAPit screen. There are a few ways to get your iPad to show up on your computer screen. Doceri is a free app that lets you sync the iPad screen to a computer screen. This is great because it’s free and it works well. You can wirelessly connect the two and use any program on your desktop. If you pay for the Doceri Desktop you get more features like creating presentations or lessons, with hand drawn annotations. All I wanted was the free version so I can sync up screens. If Doceri isn’t working for you, another option is Reflector. Reflector is software that lets you wirelessly connect your iPad or any device (iPhone or iPod Touch) to any computer, for $12.99. This accomplishes the same goal as Doceri and comes with features such as recording, password protection, and syncing up to multiple devices. I know people who use this as well and love it. The bottom line is that both seem to work fine. I would try Doceri first because it’s free and switch to Reflector if it isn’t working well. Stay tuned for more posts on lessons I use with the TAPit because there will be more! The possibilities seem endless so far and I’ll update on the coolest lessons I do. Let me know if anyone else has seen or used the TAPit, or other new forms of technology! I know it’s hard to stay up to date on the new technological advances for the classroom so let’s keep each other informed –tweet us or send us a message on Facebook!